Unlike the routine rush to work, vacation travelers often want to explore scenic routes as they travel the world. However, it’s difficult to evaluate online maps to choose the best routes based on comfort and cost. Whether you travel by plane, train, car, ferry or even bicycle, Rome2rio is an app that maps your trip for you. Rome2rio’s PR Director, Kirsteene Phelan, spoke to RewardExpert about how to make the most of your next trip. Australian developers Michael Cameron and Bernhard “Bernie” Tschirren co-founded the company. They came up with the idea while working as engineers at Microsoft in Seattle. They wanted make getting from point A and to point B easier. Instead of having to juggle multiple browser tabs, information would be displayed in the app. 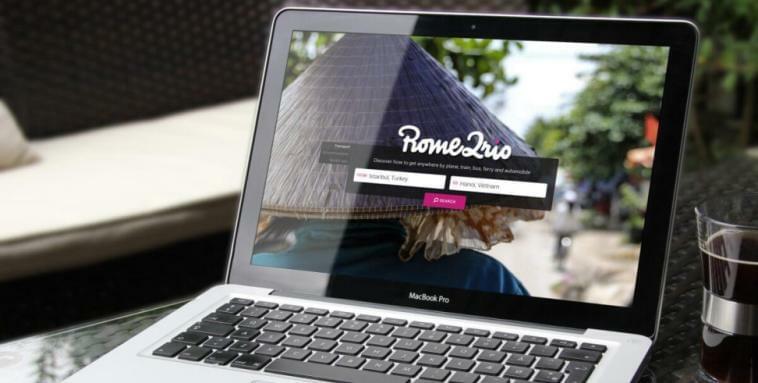 Rome2rio launched in 2011 as a platform for local and long-distance travel. A user inputs an address and landmark and the Rome2rio gives all travel route and pricing options. Rome2rio has grown to around 10 million users in any one month, according to Phelan. Peak app use is during summer when travelers flock to Europe. The app is available via desktop, Android, iPhone and iPad. “It’s the freedom to not plan ahead,” says the Rome2rio website. What this means is a traveler can search while on the road, rather than do meticulous planning ahead of time. “The app is super, super fast. Load time is lower of others of its ilk. People traveling are nervous about their next leg. They feel confident in the result,” says Phelan. “Visits to Europe offer almost endless ways to explore cities and the countryside,” says Phelan. She adds that Rome2rio’s database is actually more comprehensive than Google Maps or Go Euro. Included is information of particular use to travelers such as car rentals, bike shares and walking routes. Along with travel option, there is information on hotels and attractions in the area. In addition to Europe, North America, South America and Asia are well-covered by the app. Phelan advises travelers take advantage of the abundance of travel options for global exploration. “We need to get away from the idea that flying is always best,” Phelan says. She advises that European bus travel is a luxurious experience, unlike what it’s like in America. European buses offer Wifi and sleeping compartments. And, unlike flying, there are fewer hassles like security checkpoints. Spain, Germany, Italy and the United Kingdom are the most popular locations for Rome2rio users. “We’re improving service for when people don’t have internet access. Dial-up is expensive.” In the future, past searches will be available offline. Also, there are plans to allow users to review attractions such as a museum or art gallery without using data. Another improvement on the to-do list is to allow booking to happen in the app, rather than being directed to a hotel, bus or Uber site. Rome2rio is in the process of making agreements with companies. Rome2rio is friendly to travelers who use rewards programs. You can book everything — flight ground transportation, rental cars and hotels — using the app. Users can book with their preferred airlines and other mileage/points partners to get rewards. The company partners with third party vendors and sites that provide routing information as well as travel and hotel booking. Rome2rio has amassed more than 47,000 air routes from 670 airlines. To learn more or download the app, visit the Rome2rio website.